In the 1990s a rash of school shootings changed the landscape of American childhood. Research eventually revealed that they all had one characteristic in common: the shooters had all been victims of bullying. Suddenly, bullying, an activity that had been more or less ignored for centuries, or praised as a way of toughening up the next generation, took the spotlight as a source of personal misery and potential public menace. These researchers fell in line behind the grandfather of bullying research, the Swedish psychologist Dan Olweus, who, decades earlier discovered that school bullying victims suffered from crippling psychological sequelae including lifelong depression, anxiety, and low self-esteem. 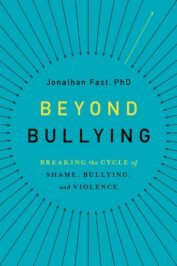 I have devoted most of my academic career to studying and writing about bullying and shame. I strongly believe that the aggression that goes on between bullying populations and vulnerable minorities (homophobia, racism, misogyny) resembles child bullying in its shame-centered motivation and toxic results. The shame comes from the universal desire to belong to a group, either explicit (church congregations, country clubs, the Boy Scouts,) or implicit (children who are good students, adults in midlife transition) and the membership being denied to them. A middle school bully might call his victim a baby, suggesting that he is not mature enough to belong to a cohort of 6th graders. A real estate broker might steer a black couple away from a white neighborhood, suggesting that they wouldn’t feel comfortable there. In either case the victim or victims have been shamed through exclusion from a group. The most important group for which belonging and exclusion are most primally felt is, to paraphrase Bertrand Russel, the group of all groups, the “uberkultur,” or the “dominant culture.” Most people yearn to be successful within the uberkultur, the exceptions being the nonconformists—the beatniks, hippies, creators of deviant art, hermits. One’s relationship to the uberkultur, however, inevitably informs many types of behavior both individually and collectively. My grandfather emigrated from a shtetl in Lithuania at the age of 15, and by the time I was born, he had achieved the American Dream. He was president of a profitable newspaper distribution company, owned a Lincoln Continental and had a black chauffeur—a schwartze, as he called him—on his payroll to drive him back and forth to work. I recall during the late 1950s and early ‘60s, hearing my grandparents discussing the predicament of the schwartzes with my parents and uncles and aunts. Despite their sympathies for the Civil Rights movement, a tone of self-congratulation might creep into the discussion, pride in all that my grandparents and their children had achieved in a relatively short time, as opposed to the meager gains of the schwartzes, who had come to America long before them. If the United States is truly sorry about these centuries of the bullying of blacks, and allowing or encouraging the bullying to take place, several acts are in order. I knew there was something wrong with this comparison of immigrant Jews and African-Americans but as a seven-year old child, I could never quite put my finger on it. So many of the blacks embedded in American culture might constitute a group that has no wish to belong to the uberkultur, because the uberkultur had bullied them and their ancestors for generations denying them educational opportunities, hiring them less frequently than light skinned competitors, paying them poorer wages, forcing them to live in ghettoes because of racist real estate practices, incarcerating them at rates vastly out of proportion to their lighter skinned counterparts, and so forth. If the United States is truly sorry about these centuries of the bullying of blacks, and allowing or encouraging the bullying to take place, several acts are in order. An official apology, a promise that it will never happen again, a closer watch and a stronger hand toward those who would violate the civil rights of people of color, and finally and most importantly, reparations, whether in the form of tax abatements, affirmative action, or even direct payment. I’m sorry I never had an opportunity to explain this to my grandfather. I would have pointed out that blacks in America probably feel the way he would had he been unable to emigrate from Lithuania and been forced to live under the rabid antisemitism of the Russian Czars. It’s not the perfect analogy but I think he would have understood. Featured image credit: graffiti art street by HypnoArt. Public domain via Pixabay. Jonathan Fast is Professor Emeritus at Yeshiva University. He attended Princeton, earned his masters at Columbia and his doctorate at Yeshiva. He is the author of nine novels; two non-fiction books on the subject of bullying, including Beyond Bullying: Breaking the Cycle of Shame, Bullying, and Violence. He currently lives in Palm Springs with his wife, the Reverend Barbara Fast, and devotes his time to writing, lecturing, and a psychotherapy practice. Dr. Fast’s comments are timely and on-point. I think the collective toxic shame carried by much of the dominant culture interferes with what he suggests would be a deeply healing and changemaking action: reconciliation, acknowledgement, and amends. The past cannot be undone. But to fail to address the harm leaves the disease in the body politic firmly in place.